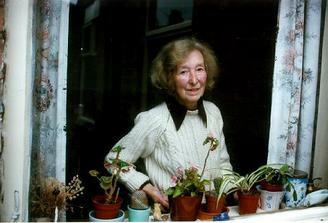 I enjoyed taking part in the project very much indeed, also writing about the photographs. I think it is a lovely and interesting place to live. As we are a very close family we know also about Highfields of the past, through memories of our parents and grandparents. We have a variety of people of all age groups, faiths and nationalities, which I think very important today. Although I cannot personally remember it, there is a real feeling of history and life here years ago. Friends who used to live around here also seem to have fond memories as well. I hope we do not have the area altered too much. 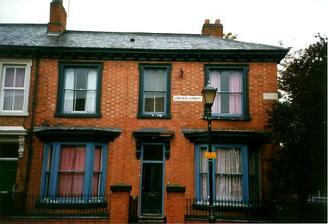 We are also near to the city centre, Museum, University, Art Galleries and our big out door market. To go into town along New Walk on a nice day, is a delight, or a visit to Victoria Park. It is actually not all past history, there are new houses and schools and tower blocks, but all seem to fit in very well. 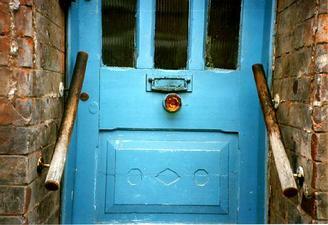 An Avon Street front door with its amber glass knob. I specialy like this, as it is identicle to 13 St. Peters Road, which is where we used to live. That has now been replaced by a modern one. 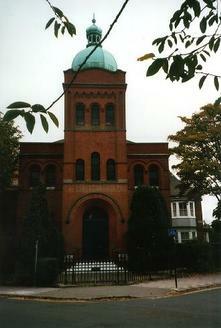 The Synagogue, Highfield Street, a very unusual and distinctive building. When I was quite small I used to think how nice it looked with the pale green dome and gold lettering over the doorway. 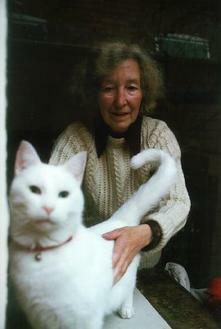 With Willow, beautifull white cat, about 3. He came as a foster kitten from the Cats Protection League, and was adopted after a few months. I enjoy helping at their coffee mornings and fairs, also the RSPCA, you make lots of friends. Most of the family have cats for pets, my niece and her husband have a lovely West Highland terrior called Sailor. Alma Knight 1997. 48 Lincoln Street, Mr. N. Haynes, Vetinary Practitioner used to live here. He was very kind and would let the pets look around the surgery before their treatment. The surgery was a very big room and the patiants were often given a tasty snack before comming home. 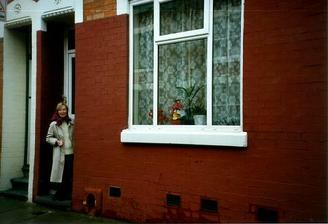 52 Gopsal Street, it was our parents first home when they were married, and I was born here. a very nice sitting room with french windows leading on to the garden. My sitting room window and favorite plants. Some have been gifts, a little cactus has survived for years. This used to be a Victorian window with 4 panes and sash cords. Alma Knight 1997. 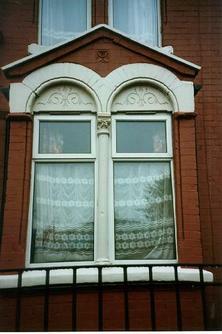 Avon Street, decorative stonework over a window. Many houses around here have attractive stonework, and some also have wooden edges along the eaves. 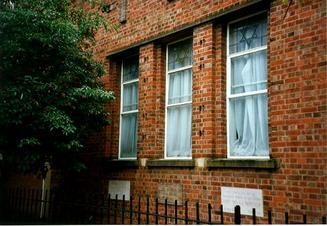 The Jewish Reception Hall, a fairly modern building. 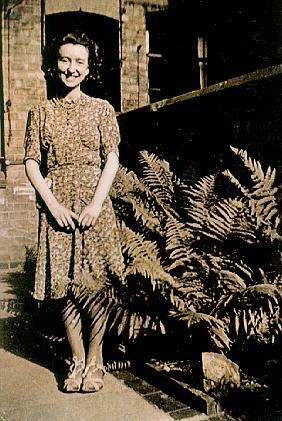 Our mother used to go to very nice occasions, afternoon tea, and sale of lovely clothes and shoes and fashion jewelry. In aid of the Israel Babies Homes, recently in the news. 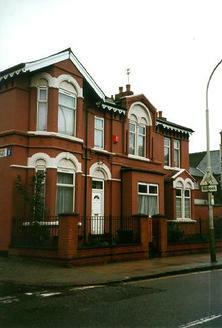 13 St.Peters Road, Public Dispensary. We lived here for about 2 or 3 years with my grandparents. The window on the left was opaque blue glass and was the waiting room. Leading off was the Pharmacy, painted pale green, also a beautifull tiled hall floor. We had lots of family and friends comming, and loively Christmas and special occasion parties. 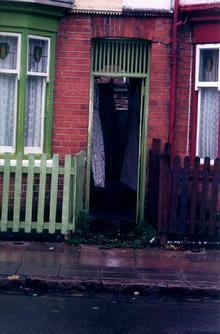 The same house today with washing drying in the entry, just as it did in the 1940's. 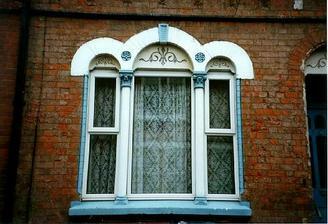 Windows at no;13. Another view of 13 St.Peters Road, our mother and father were married from here, at St.Peters Church, and had a family reception afterwards in the big front room, everyone said how lovely it was.